The Vancouver Walnut 4 light clear glazed door is part of our range of good value pre-finished doors offering an alluring sleekness of design which adds to a room’s interior styling and the Supermodel range will definitely add the perfect finishing touch to any newly designed or refurbished room in a variety of residential or commercial and hotel settings. The range represents particularly good value for money against similar doors. All Supermodel Flush doors are supplied pre-finished. The doors all feature grooves within their design. Suitable for any home and hotels and offices the Vancouver Walnut glazed is very popular with home builders and residential buyers. This door is available in 35mm and also as a 44mm FD30 fire door, and there are some metric sizes as well as the standard imperial ones available. Ask our sales team about stock availability and the delivery service that we can offer with this door. The majority of our Internal and External doors are manufactured with engineered component parts. This ensures that the doors provide a solid feel, and the engineering brings an advantage in terms of strength and stability. 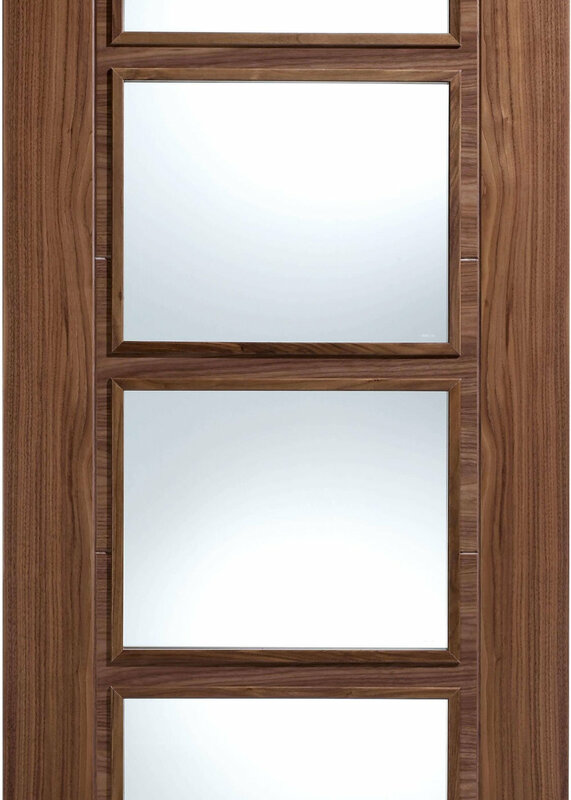 All of our engineered doors are faced with veneers and matching lipping along their edges like the Vancouver Walnut 4 Light Clear Glazed door.